How's that for aliteration, huh? Paul's plum pandowdy. But the best part of this dish, the file-away-in-the-recipe-box part, isn't even in the title, because it's the delicious rye crust. But before we get to that, first, the plum pandowdy. Algerians can grow some serious plums. 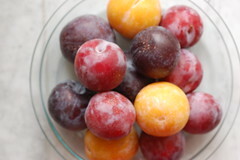 Tiny glowing orange ones, dark purple prune plums, red plums, plums are available here for most of the year (eclipsed in winter by citrus season) and are reliably delicious. There aren't many pies and tarts made with plums, but they work beautifully. If you're worried plums would be too runny for a pie, aim for firm-ripe (not over-ripe mushy) plums, and dash of cornstarch takes care of the rest. A pandowdy is, simply, a pie without a bottom crust. Halfway through the baking, you cut some slits in the top crust to "dowdy the pan" allowing the juices of the pie to bubble through the slits. We started off with this cornmeal pandowdy for inspiration, but instead of a cornmeal crust I made a rye crust from the excellent Kim Boyce. I've talked about how much I like putting rye into baked goods so often here, if I talk about it again you'll probably want to poke my eyes out. But seriously, rye pie crust needs to be in your arsenal stat. Luckily, this recipe makes a double crust so you can make a pandowdy, and then still make another pie. A pear pie with rye crust and rye crumble? Oh yes, that's happening next. There might even be a rye crust at Thanksgiving. What about you all? 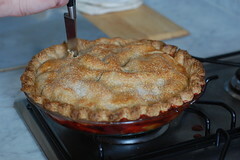 Are you making pies, pandowdies, buckles, or crisps for the holiday? Do you have a secret crust weapon? Let me know in the comments. A couple notes: one, don't make the fluted crust like you see in the pictures here, it will prevent your crust from dowdy-ing. Is there anything worse than an undowdied crust?! Second, you need slightly less crust than normal for this, since it only goes over the top and not the sides of the pie. Therefore, when dividing your dough make one dough ball slightly smaller than the other, and use the small one for the pandowdy. 1. Make your crust: Combine flours, salt, and sugar in a large bowl. Rub the butter into the flour with your fingers, two knives, or a pastry cutter. Mix the water and vinegar in a small bowl, measure out 1/2 cup of of the liquid. Quickly stir the 1/2 cup of liquid into the pie crust. Mix until the liquid is evenly distributed and the dough holds together when you squeeze it. It will be fairly dry. If you need more moisture add the liquid 1 tbl at a time. 2. Divide the dough into two, wrap in plastic, and refrigerate for at least 1 hour. (You can freeze the second crust, since you won' t be using it). 3. Make the filling: Preheat oven to 375F. 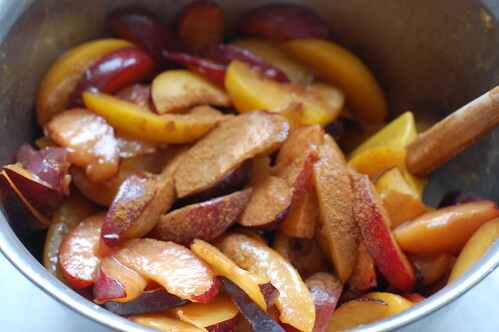 Combine sliced plums, sugar, cinnamon, cornstarch and lemon in a large bowl. Toss to combine. 4. In a small skillet over medium-low heat, brown the 2 tablespoons butter until the butter solids are brown and toasty smelling. Pour browned butter over plums and stir gently. 5. Roll out crust: Remove one crust from the fridge, let warm up slightly, then on a floured working surface roll the dough into a rectangle, about 10x14 inches. Fold the dough over itself in thirds like a letter (this will make the crust flakier). Now roll the dough out into a circle that is the same circumference as your pie pan. Don't worry about trimming the edges. 6. Pile plums into a pie pan. Fit your rolled out crust over the pan and tuck the edges of the pie crust down into the pan (this will help the juices bubble over later). Cut four small slits in the pie crust. Brush the pie crust with the beaten egg white, then sprinkle with the two tablespoons of sugar. 7. 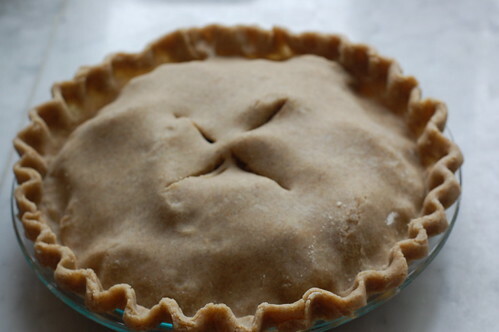 Place pie on a baking sheet to catch any bubbling juices. Place pie in the oven and bake for 30 minutes. 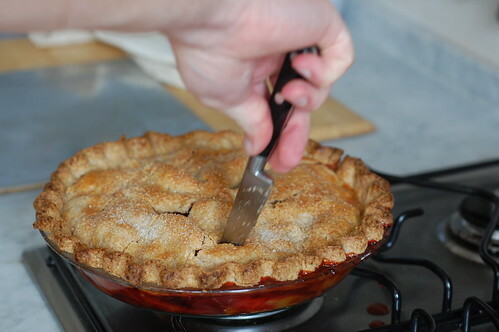 Remove the pie form the oven and, using a sharp knife, cut a crosshatch pattern into the top of the pan. Press the crust down just a little bit to encourage to juices to bubble over. Return to the oven. 8. Bake the pie for another 20-30 minutes, until bubbling and browned. Cool for at least 20 minutes before serving.